Some day, the humid stench of rancid street meat and vomit won't be the only thing radiating out of some NYC trash cans: Add WiFi to the list. It's a weird list, admittedly, but one that just got way more useful. Bigbelly, a Massachusetts-based waste management company, hopes to upgrade its fancy, solar-powered "smart" trash and recycling bins with free WiFi hotspot capabilities soon. 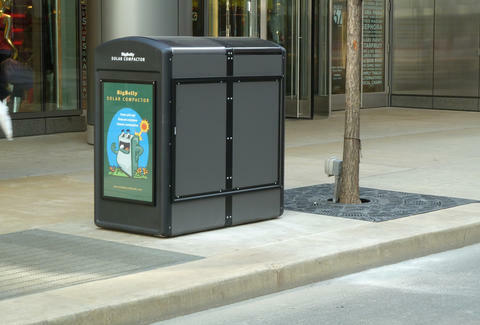 You may recognize the current receptacles around town as the ones that aren't overflowing, black-metal buckets. If Bigbelly has its way, we'll all get literal garbage WiFi, and no, we're not talking about your Time Warner service. Jokes aside, the new technology could provide convenient WiFi access, collect data on waste management, and even display public messages, according to a report by CityLab. Bigbelly has already tested the service in at least two of its over 170 Lower Manhattan trash cans, but apparently, the city wants more. The company plans to conduct additional pilot tests this year and could potentially expand the service with grants and backing from sponsors, which means you'll finally be able to post your trashy Instagram selfies via the trash. Keep your eyes peeled for "GARBAGE PUBLIC WIFI" or "OVERFLOWING TRASH CAN-GUEST". They might make you reconsider how useful NYC's trash cans are. Tony Merevick is Cities News Editor at Thrillist and can now follow his dreams of launching a startup from a park bench. Send news tips to news@thrillist.com and follow him on Twitter @tonymerevick.